Details: Gallery Exhibitions & Art Fairs. Venue: Thompson’s Gallery. Marylebone. London & Aldeburgh. Venue: Broomhill Art Hotel & Sculpture Garden, Barnstaple. Details: Gallery exhibitions & sculpture in the garden. 2017 Sogno di un Artista – Sensorial Theatre performance inspired by Marino Marini. Venue Marino Marini Museum, Pistoia, Toscana. Details: Solo artist representing the sculptor Marino Marini, alongside actors & performers. Venue: Palazzo Malaspina, San Donato in Poggio, Toscana. Details: Art in Sight – a mixed show. Venue: Sioux Falls, South Dakota, USA. Details: ‘Aspects of Time’, Exhibiting with a danish painter. Details: ‘Sansning & Sensualitet’ (Sensazione & Sensuality). Venue: Islington Business Design Centre. Details: Art 2004′ Art Fair. Venue: First Sight Fine Art. Bath & The Sheraton, Heathrow. Venue: Kirsten Kjærs Museum, Denmark. Venue: Morsø Bilbilotek & Kunst Galeri. Denmark. Venue: The White Cube, Lancashire. Venue: Open Eye Gallery, Edinburgh. Venue: The Raw Gallery, Soho, New York. Venue: The Hannah Pescher Gallery, Ascot. 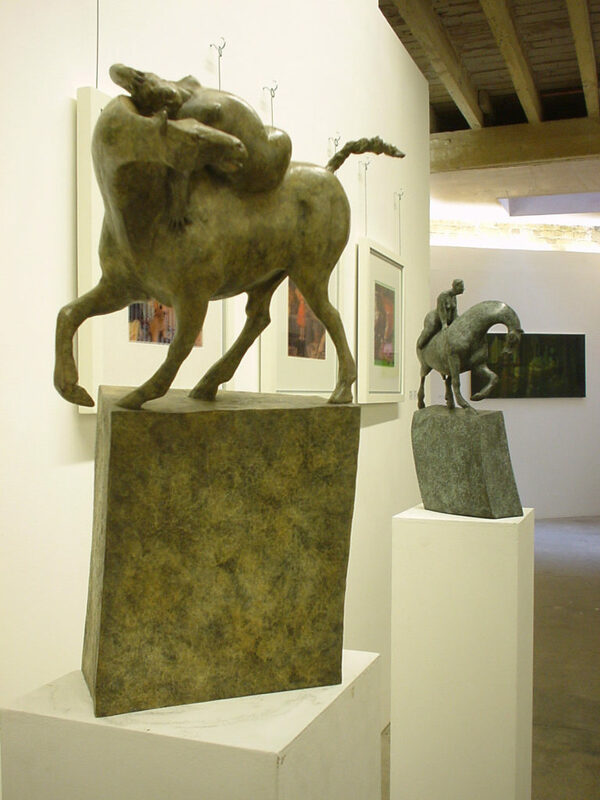 Venue:The Jonathon Poole Gallery, Oxfordshire. Sculture to commemorate the poet and writer, Jens Auguste Schade, in his birthplace. Venue: Piazza Centro Storico, Skive, Nord Jylland, Denmark. Details: Awards for the ‘Borge Ring Animation Film Award & ‘Talent Awards’. Details: ‘Navigator’, Part of a Swimming pool complex. Venue: Broomhill Hotel Sculpture Garden, Barnstaple. Venue: Vester Thørup Klitplantage & Kirsten Kjærs Museum Thy. Details: ‘Metamorfoser’ Symposium of Land Art. Venue: Højriis Slot og Gods, Morsø. Denmark. Details: Scultura di bronzo sculpture, ‘Horseman Guardian’. Venue: Brockhall Village Estate, Lancashire. Details: Life-size bronze sculpture, ‘Warrior I’. Venue: Pride of the Valley, Giardino delle sculture, Farnham. Details: Bronze sculpture ‘Warrior I’. Details: 1/2 life-size Bronze sculpture, ‘Acrobat I’. Morsø Folkebilbilotek Kunst Galeri. Denmark. Pride of the Valley, Sculpture Garden, Farnham. Kirsten Kjærs Museum, Thy, Denmark. Aberystwyth Art Centre. Bought by Welsh Arts Council. Details: ‘Metamorfoser’ Symposium of Land Arte. ‘Sculpture Parks & Trails of England’ Book by Alison Stace. 1st & 2nd Editions. ‘Sculpture Review’ Publication of International Sculpture. ‘The Encyclopedia of 20th Century British Sculptors. The 2007 Calendar, of the Royal British Society of Sculptors. R.B.S. – The Royal Society of British Sculptors. Dansk Billedhuggersamfundet – The Royal Society of Danish Sculptors. Sioux Falls Sculpture Walk , South Dakota, USA.